In the past, you could only set the default deal properties when creating deals in Workflows. Other properties, including required properties, could not be set. This meant that you would have to manually populate information after the deal was created. 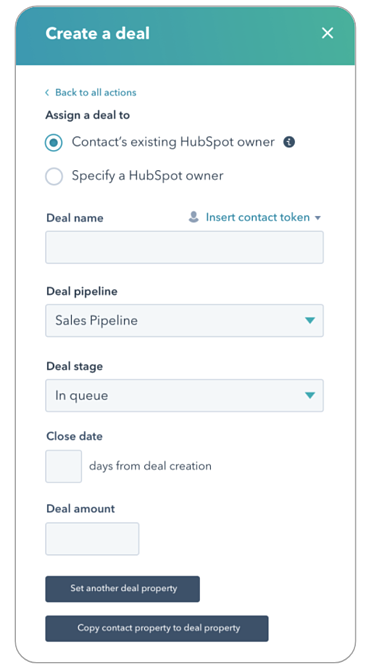 Now, if you create deals automatically from a form submission, you can copy that information from the form into the deal without that manual step. 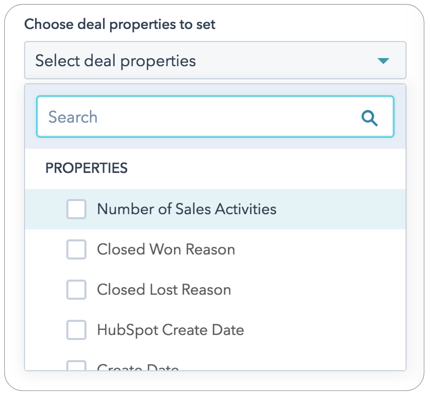 “Set another deal property” allows you to choose any additional deal properties you’d like to set, and then what value you’d like to set them to for all the deals created through the workflow. “Copy contact property to deal property” allows you to set additional deal properties by copying them from contact properties. This update is available to HubSpot Sales Professional users and grandfathered Marketing Professional and Enterprise users.